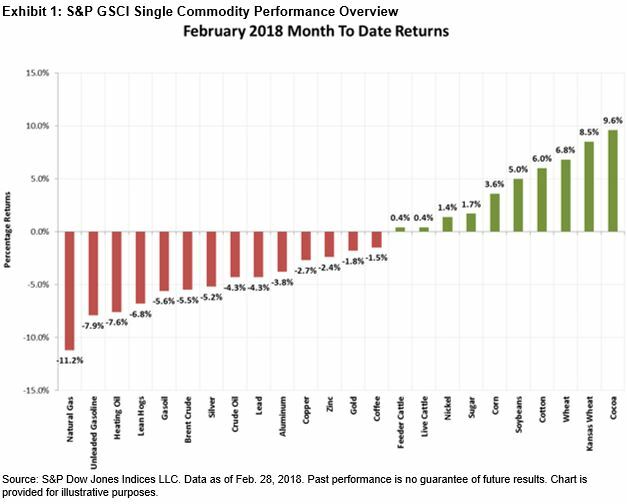 The Dow Jones Commodity Index (DJCI) was down 1.9% for the month and up 0.7% YTD, and the S&P GSCI was down 3.3% and flat YTD. Energy was the worst-performing sector, while agriculture was the best. 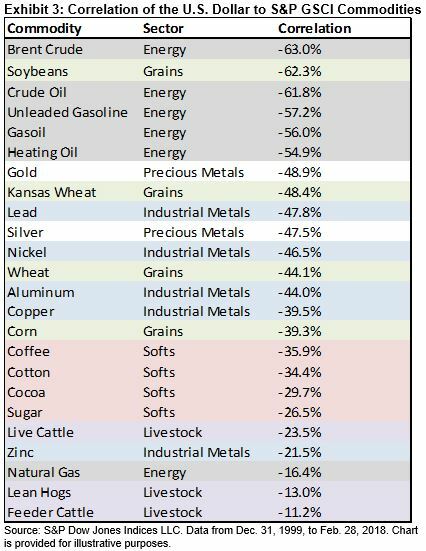 Of the 24 commodities tracked by the indices, 14 were negative in February. Cocoa was the best-performing commodity for the month, while natural gas was the worst. The purpose of this blog is to assess how commodities perform during different interest rate environments, as well as with a background of a strengthening and weakening U.S. dollar. Higher interest rates are usually indicative of healthy economic conditions, and hence equity markets tend to do better when interest rates are higher. Meanwhile, bond markets have an inverse relationship with interest rates. Commodity prices and interest rates are sometimes seen as having an inverse relationship due to the cost of financing storage and stockpiling, since central banks are able to set the levels for short-term borrowing. However, the cost of storage or convenience yield is not equal for all commodities, as we discussed in “Commodities: A Deeper Dive Into the Five Potential Sources of Return.” For example, natural gas is costly to store because it has to be kept in liquid or gaseous form at low temperatures, and some agricultural products may deteriorate over time, while base metals are relatively easy to transport and store. Exhibit 2 depicts the analysis of the correlation levels between the S&P 500®, the S&P U.S. Aggregate Bond Index, and the 24 commodities included in the S&P GSCI against the U.S. Federal Funds Rate, from Dec. 31, 1999, to Jan. 31, 2018. The analysis showed positive correlation between interest rates and stocks, and an inverse relationship for bonds, while commodities resulted in diverse results. All the grain commodities had an inverse relationship with interest rates, while most of the softs, except for cocoa, had a positive relationship. Energy, industrial metals, and the livestock commodities were mixed. Silver had a positive correlation, while gold, which is considered a safe-haven asset, had an inverse relationship with interest rates, since market participants tend to move away from gold in search of better yield. In general, commodities tend to exhibit a negative relationship with the U.S. dollar because commodity prices are weighed down by a stronger U.S. dollar, since a rising U.S. dollar can make buying commodities that are pegged to the U.S. dollar more expensive for market participants using relatively weaker currencies. However, the sensitivity to the greenback is not equal among all commodities (see Exhibit 3). 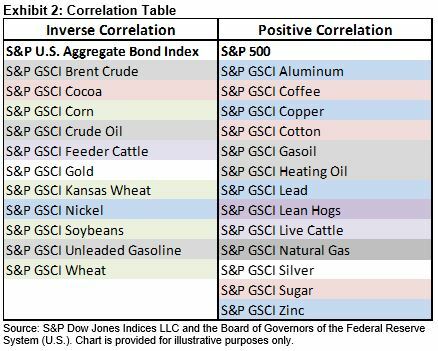 The correlation between the 24 commodities included in the S&P GSCI and the U.S. dollar were all negative for the period studied, with the petroleum commodities having the highest inverse relationship. However, while there was a negative relationship in the long term, the mechanics of supply and demand, as well as shortages and surpluses seem to mostly drive commodity prices in the short term. This could add a diversification benefit to a portfolio constructed of stocks and bonds in the long term, across varying interest rates, and in currency fluctuation environments.